For most visitors to Russia, its rivers are noticed only while crossing a bridge or strolling along an embankment, as pleasant backdrops to sights that command more attention. To experience Russia only from the land, however, is to miss a central feature of its character, for river travel has stood at the heart of Russian life for millenia. All of the greatest cities of European Russia have since their foundation been intimately associated with the rivers that they adjoin. Moscow, for example, sits at the confluence of the Moskva and the Neglina, and St. Petersburg and Novgorod lay on the Volhov. 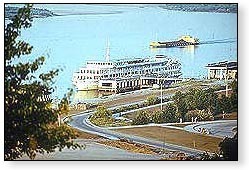 The greatest of Russia's rivers, however, is the Volga. At 2,300 miles (3,700 km), it is the longest river in Europe, navigable for virtually its entire length. It was along the Volga that the ancient trade routes of Russia were developed, giving rise to a whole string of trading posts, fortresses, and towns during medieval times. Yaroslavl, Uglich, Kostroma, and Nizhni Novgorod, four of Russia's most revered and beautiful cities, are all situated along its banks. 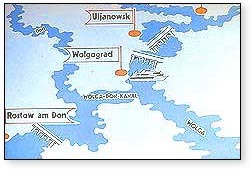 With the completion of the impressive Moscow-Volga Canal in 1937, the capital was finally linked to the great system of waterways that runs from St. Petersburg on the Gulf of Finland all the way to Astrakhan on the Caspian Sea. As a result, it is easy today to experience the trip that Peter the Great first dreamt of--a leisurely sail from St. Petersburg to Moscow, passing by the finest medieval cities in the country. For the particularly ambitious traveller, it is entirely possible to follow the entire trade route along the Volga, from St. Petersburg all the way to Astrakhan, the ancient capital of the Tatars. One of Russia's oldest cities, Yaroslavl was founded by Yaroslav the Wise of Kievan Rus' in 1010. Over the next several centuries the city prospered as a trading port on the Volga and a center of textile manufacture, becoming by the 17th century the second largest city in Russia behind Moscow. Its wealthy merchant community became notable patrons of the arts, building hundreds of churches. Fortunately, the great majority of these remain intact today, making the city one of the most beautiful destinations in Russia. The approach to Uglich is one of the most memorable sights of a cruise along the Volga. Bereft of the usual screen of Kremlin walls, its especially fine churches and cathedral rise up from the horizon in a brilliant play of red, blue, and gold. The city's visual appeal, as well as its tragic past, have made Uglich one of the most beloved cities in Russia. Founded in 1148, it flourished during the 13th and 14th centuries, and was favored in the 16th by Ivan the Terrible. Not only did Ivan use Uglich as a base for his campaigns against the Golden Horde, but he also selected the city as the location of his seventh wife's honorary exile from Moscow. Upon Ivan's death, his son Dmitry joined his mother here, only to be brutally murdered by Boris Godunov as part of his campaign to seize the crown. On the spot where the murder took place, the city built the magnificent Church of St. Demetrius on the Blood, which greets the eye of all who approach the city. 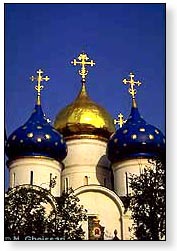 The Cathedral of the Resurrection and St. John's Church are nearby, similar in design and beauty. Kostroma's associations with great figures in Russian history is second only to Moscow and St. Petersburg. It was founded in 1152 by Yuri Dolgoruky, who also gave Moscow its start. Kostroma experienced its first great period of prosperity as the home of the Godunov family, which arrived in the 14th century and quickly rose to prominence in the region. By the time that Boris Godunov enjoyed his brief and tragic reign as tsar, the city had become the third largest commercial center in Russia, surpassed only by Moscow and Yaroslavl. After Godunov's fall and the Time of Troubles, the throne was offered to Michael Romanov, whose family had long been fierce opponents of the Kostroma Godunovs. However, as chance would have it, it was in Kostroma itself that Michael was elected Tsar. The city of his enemy became a sort of adoptive hometown, and the Romanovs continued to provide the city of he fallen Godunov's with influential patronage. Although Michael began this tradition, it was Catherine the great who eventually had the greatest impact on Kostroma's appearance. After a disastrous fire in 1773 which destroyed all but a few buildings, Catherine decided to turn the city into a showpiece for her enlightened design principles. She sent in a slew of her best designers from St. Petersburg, and within a few years Kostroma had been transformed. The city center remains as one of the finest examples of late 18th century architectural principles in Russia. Of particular interest are Susanin Square, the Ipatyevsky Monastery, and the outdoor museum, containing a number of fine examples of traditional wood-construction architecture. Nizhni Novgorod was until quite recently a closed city, best known to westerners as the exilic home of Andrei Sakharov after he denounced the war in Afghanistan. Nizhni is Russia's third largest city and a major industrial center. Although it dates back to the 13th century, the majority of its most interesting sights are from later periods. Foremost among these is the city's great, brooding Kremlin, built during the 16th century. Formerly and most famously known as Stalingrad, this historic city was founded in the late 16th century to defend the land that Ivan the Terrible had wrested from the Tatars. Then known as Tsaritsyn, the city was for the first several centuries of its existence primarily a military stronghold. In fact, the bulk of its history is one of military conflict. Late in the 17th century, and again in the late 18th century it was captured by Cossack rebels. During the civil war that followed the October Revolution, the city was defended by Stalin and other Bolshevik commanders. In 1918, it fell to the White Russian army, but was retaken two years later. In 1925, as Stalin rose to power in the Soviet government, the city was renamed Stalingrad. By World War II, Stalingrad had become a major commercial, industrial, and transportation center. It was also the regional center for the rich Caucasus oil fields. All of which, of course, made it quite attractive to Nazi Germany. In the summer of 1942, just as the Soviet Union was turning back the German offensive against Moscow, Hitler launched a major drive toward Stalingrad. The German force numbered over half a million men, including units from a number of different Axis countries. Stalin ordered that the city be held at all costs, and Hitler ordered that it be taken at all costs. The Soviets, vastly outnumbered and outgunned, resisted with a tenacity that is scarcely credible. The Germans were forced to fight house-to-house, slowly working their way through the city by reducing it to rubble. By November, the Germans had still not been able to extricate or overwhelm the small remaining Soviet garrison. General Freidrich von Paulus, their commander, thought it time to withdraw--Hitler refused. Within weeks, two Soviet forces had encircled and captured all of the remaining German forces. The city had been relieved, though there wasn't really any city left. The battle of Stalingrad has long been considered the critical turning point of World War II. Had Hitler succeeded in his attack and taken control of the Caucasus oil fields, he would have had enormously greater resources with which to fuel his armies. Having failed to do so, and having lost an enormous and experienced army in the process, was disastrous. After Stalingrad the Russians advanced almost continuously all the way to Berlin. The reconstruction of the city began immediately. 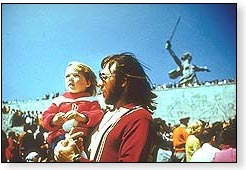 Its heroic defense is commemorated by the remarkable 170-foot statue of Mother Russia wielding a great sword of victory. The statue stands atop Mamai Hill, the site of the battle's most intense fighting. Although nothing survives of the old city, Volgograd is once more a prosperous commercial and industrial center.